Yep, I said it. 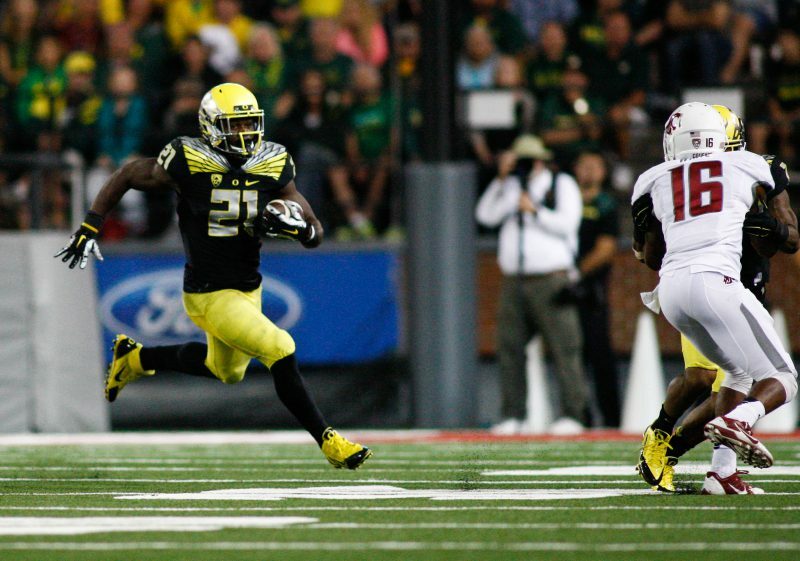 Royce Freeman is a running back that should be in the Heisman discussion right now. Speed, power, good in short yardage and he can bounce it outside. And he offers the kind of lifetime numbers that will help East Coast writers understand how good he’s been and for how long. I’m not arguing there aren’t other great backs in the country, and quarterbacks usually win the Heisman. I’m arguing that Freeman, for whatever reason, isn’t getting his due and it’s insane. The numbers alone tell most of the story. Freeman’s 44 rushing TD’s give him a shot at finishing 10th all-time. 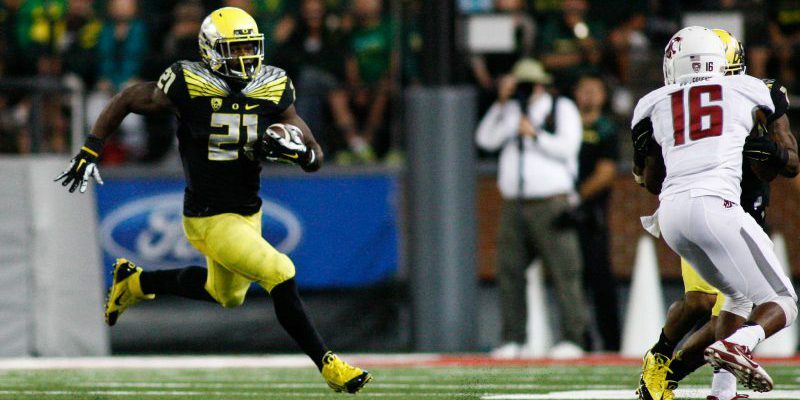 Oregon’s feature back enters his senior year with 4,146 rushing yards. If Freeman had gone uninjured and had just a sub-par previous year, delivering, say, 1,300 yards rushing instead of 946, he’d have about 4,500 yards. That would have given him a shot at finishing in the top three-four in the history of the sport. Freeman averaged 5.3 yards last year while being injured and everyone thought he had an awful year. 5.3 per carry. He’s likely to average about six yards a carry again this year. A 1,500 yard season by Freeman would put him sixth on the all-time list. Passing Herschel Walker, Charles White, LaDainian Tomlinson, Marshall Faulk and Marcus Allen among 90 others. Consider that with his current total was accomplished with three quarterbacks and basically an all true freshman line last year after the midway point. Think that doesn’t matter? It does. Freeman for Heisman. What’s the best slogan we can come up with? Royce finally some health and a quarterback, maybe a quarterback who’ll play more than 10 games with him. Best running back in college football this season. Freeman will be playing behind a young but experienced offensive line. For all the yammering about Christian McCaffrey, he finished his three year career with 3,912 rushing yards; that’s over 200 less than Freeman, who was hurt last year. This offensive line got its feet wet last year and returns almost intact, except for Cameron Hunt. Freeman’s balance, power and running instincts make him one of the games best ever. The numbers will soon prove it. Balance, power, and the ability to make the highlight play are all part of his package. As he moves up the ranks for all-time rushing and touchdowns, the media will have something tangible to talk about. Freeman has 44 rushing touchdowns in his career, 59 would put him in the top ten all-time. He’s averaging almost 15 a year and that’s with a bad previous year. If he gets 17 or 18 he’s around seventh or eighth. That’s easy to quote and easy to promote. Same thing with his rushing totals. He’s on pace with a decent year to finish in the top 10 all-time. A 1,500 yard season would leave him seventh all-time. Also, cliches matter and everyone loves a comeback story. 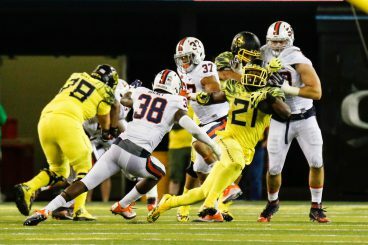 After Oregon’s season last year, pundits would love to talk about a guy who ‘stuck around,’ a guy who ‘stuck it out,’ ‘finished his degree’ and helped the program get turned around. Finally, Freeman is by all accounts a clean guy. No issues in four years, will graduate, does community work and is a team player. He’s also a pretty good blocking back and catches it out of the back field whenever asked. 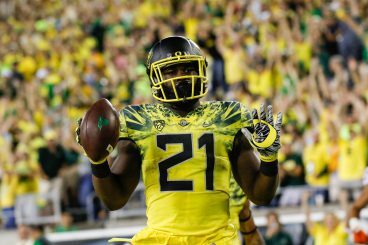 If Oregon lets him return kicks, catch it some and run it a ton, Royce Freeman could be in New York City next December with a real shot at the Heisman. It’s a typical year filled with quarterbacks from Josh Rosen to Sam Darnold, but there will almost certainly be one running back at the ceremony. Freeman has a great shot at being that back. His biggest obstacle might be that both of those quarterbacks are on the West Coast and in LA, where the media will talk about them incessantly. Regardless, Freeman’s game and numbers show he belongs.